The purpose of this policy is to provide our current, past and future customers with information about how and why we process your personal data, what personal data we process, how long they are stored, and how to request that your personal information be corrected or deleted. This policy may be updated, and the latest version is always available on our website. How and for what purposes do we process your personal data? We are aware of and appreciate the trust you give us when you provide us with your personal information and we protect your privacy. In order to offer you our services and products, we need to process your personal information as below. We do this with the utmost account of your integrity. The information you provide and that we collect ourselves, including financial information, in order to fulfil our business agreement, constitutes a contractual basis for the processing of these personal data. Other grounds for collecting and processing personal data may be, for example, explicit consent, legal obligations and interests subsequent to a majority interest. Cranab will only process personal data that is accurate, relevant and necessary in relation to the purpose for which they have been collected. You may directly or indirectly provide us with information about yourself and your company in a variety of ways, such as when you make a request for a product or service that we sell, when you order something from our website, report that you want to get newsletters, interact with our social media, buy our products or contact us by mail, letter or phone. We are particularly careful when we collect and process sensitive personal data, as required by applicable law. The information you provide and the information we collect about you, as well as information about the products / services and the financial information is generally necessary to enter into a contractual relationship with us, while the other information we collect generally is necessary for other purposes, as described above. In order to fulfill our commitments to our customers and other stakeholders, we may transfer or share the information with third parties such as suppliers or subcontractors, authorised resellers and distributors or service providers. We take all reasonable legal, technical and organisational measures to ensure that the data is handled securely and with an adequate level of protection upon transfer to or sharing with such third parties. We may provide necessary information to the authorities if we are required to do so by law. Cranab will not sell your personal information to third parties. Where do we proccess your personal data? Cranab handles personal data within the EU / EEA and in case of transfer of personal data to countries outside the current area, Cranab will take all reasonable legal, technical and organizational measures to ensure that the data is handled securely and with an adequate level of protection. We will keep your personal information as long as it is necessary to fulfill the purpose for which the information was collected, as described in this policy, or to fulfill our obligations and for as long as we are required to do so by law. How is your personal data used for marketing? We may provide you with information about new products, services, events or similar marketing activities. We will not sell your personal information to third parties and we will not share your personal information with third parties for their marketing purposes. How do we handle your personal data on the web? 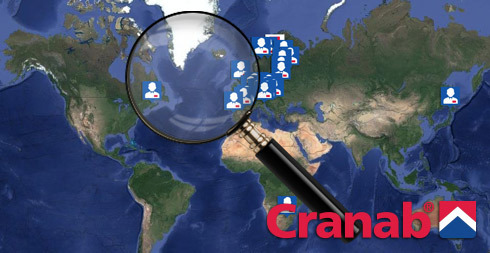 In general, you can visit Cranab's websites without telling us who you are or revealing any information about yourself. However, in order to provide you with certain services or offers, we usually need to register certain personal information that you provide us with, such as your name and e-mail address. For as long as your personal data is stored, you can request to extract the data, get the data corrected or deleted. You are entitled to request information about the personal data we process relating to you, where the personal data is collected, the purpose of the processing and the recipients or categories of recipients with whom the personal data is shared. You also have the right to request that we correct, block or delete any incorrect information related to you. Your request should be processed promptly and correctly. The request to delete personal data is processed with regard to any applicable legal requirements. In cases where there are legal obligations that prevent us from immediately deleting parts of the data, these data will not be used for purposes other than complying with such legal obligations. You also have the right to complain about the processing of your personal data to the Data Protection Authority.